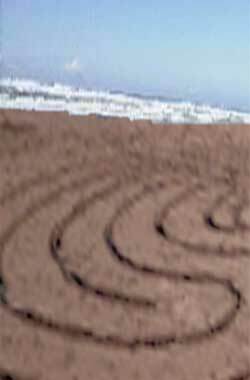 Uniting ourselves with our innate sense ability is often an occurrence of the labyrinth, though perhaps not fully appreciated for the activation it brings to the senses. Our human appreciations often extend to what we realize with a cognitive mind that relaxes in a walk, though what helps it to relax the mind isn’t just in what we see with our visual sense, or understand with comprehension, it is also heightened by what and how we touch, hear, taste and smell in our experiences. 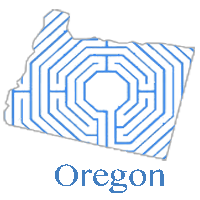 The state of Oregon has encouraged many labyrinths with a number of enthusiasts to inspire a curiosity within. Among them these four inspire the senses. 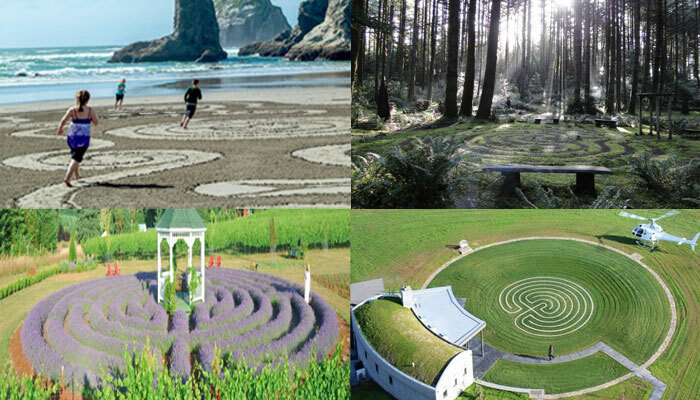 The labyrinths at Bandon Beach invite the barefoot experience of feeling the natural element of sand beneath each step. The breeze of the sea air brings a refreshing sense felt in the body. Denny Dyke, an area artist invited a New Year’s celebration in 2015, and perhaps a way to feel our way into a new year. Move south by only 20 minutes and one can discover the artist town of Port Orford and while art can stimulate our visual abilities, they also often invigorate our other senses indirectly. The labyrinth at Wildspring Guest Habitat however invites a walk in the woods for a sacred listening experience. Hearing the sound and effect of the breeze through the trees for instance stimulates our auditory to sharpen its acuity and listen to the sounds of what moves around us and often within us. Stimulating the olfactory sense, the scent of lavender at the TeBri Vineyards stems from seeding and nurturing of a lavender labyrinth planted in 2009. Where we might overlook our chemoreception of smell, it is our great detection source deciphering over a trillion different smells according to a new study at the Rockefeller University. An often overlooked sense, the olfactorial process is a great aid to exploring and expanding our human abilities and a walk with a focus of lavender with its numerous curative properties might be a healthy healing walk indeed. The final sense of taste awaits at the Fairsing Vineyards where the discerning abilities of varietal grapes are further explored on the labyrinth outside the tasting rooms. In Oregon there are a number of different wines relating to the labyrinth, yet the TeBri and Fairsing vineyards allow the opportunity to move and explore greater capacities. Our sense of taste is an exploratory field adapting to its available environments. At least six basic tasting abilities our found to help us identify and detect and while there are offshoots of those basic categories, we might discover more of them in our discerning walks with it in mind. The labyrinth yields us opportunities to expand ourselves to the environment and the environment to expand for us. Using the senses today, we open our abilities in a greater sense and honestly look at what we can do when we utilize more of our natural functions. Oregon is a welcome host to that investigation and leaves us in a more complete sense. Explore more of your sensory abilities as you turn into a new direction in your walk of today, heighten your awareness to a more discerning level to notice what activates, integrates and makes more sense of our body in our environment.